Judge Waverly Crenshaw presents awards to honorees Judge Richard Dinkins (center) and retired judge Thomas Wiseman. 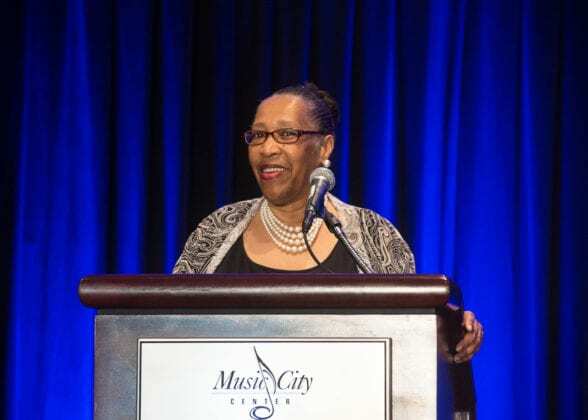 NASHVILLE, TN — Nashville’s ongoing efforts and court battles to desegregate Metro Nashville Public Schools lasted more than 40 years. Those efforts made it possible for all children, no matter the color of their skin or the place of their birth, to attend public schools. 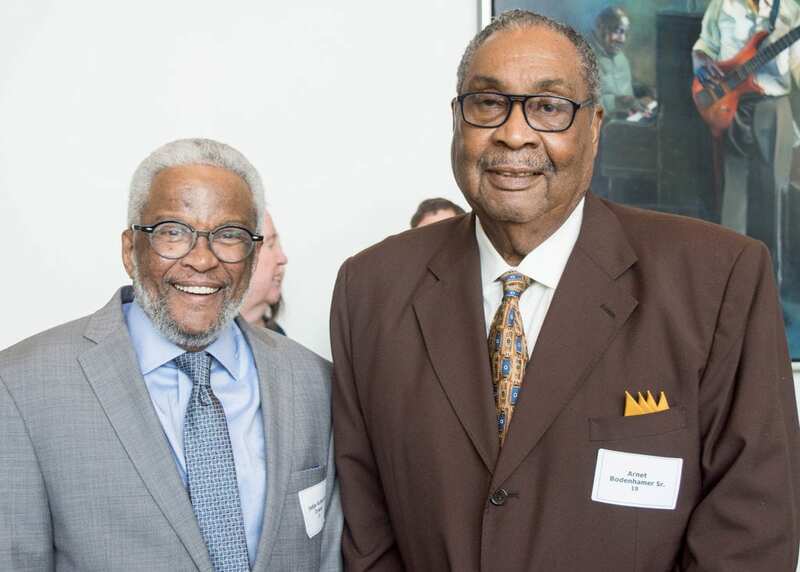 Retired U.S. District Judge Thomas Wiseman Jr. and Tennessee Court of Appeals Judge Richard Dinkins were honored for their many years of their work for school desegregation at The Community Foundation of Middle Tennessee’s third annual Francis S. Guess Bridge to Equality Fund luncheon, which attracted a crowd of nearly 400 people on May 11 at the Music City Center. 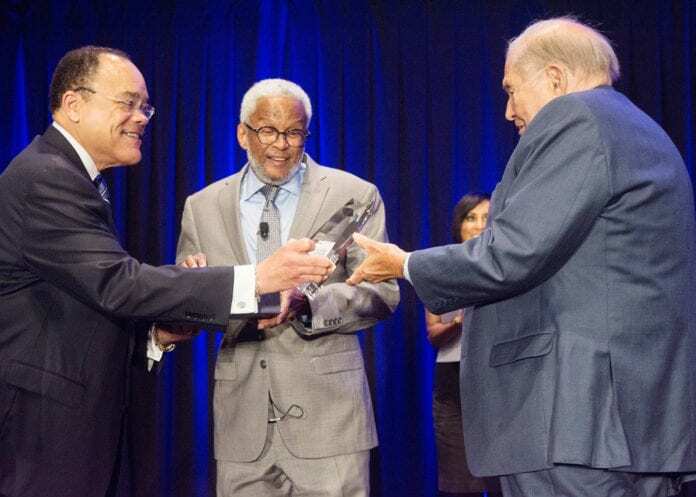 “We are honored to have you here and forever grateful for your work,’’ renowned attorney Aubrey Harwell said as he introduced to the stage a panel consisting of Wiseman, Dinkins, and former State Supreme Court justice Bill Koch. Now dean of the Nashville School of Law, Koch moderated the 30-minute panel discussion, which analyzed what the desegregation struggle meant to Nashville through those years, and what effect it has had on today’s educational system. Archival newspaper photographs from the Metro Nashville Public Library archives and its Civil Rights Room accompanied the discussion on two video screens. 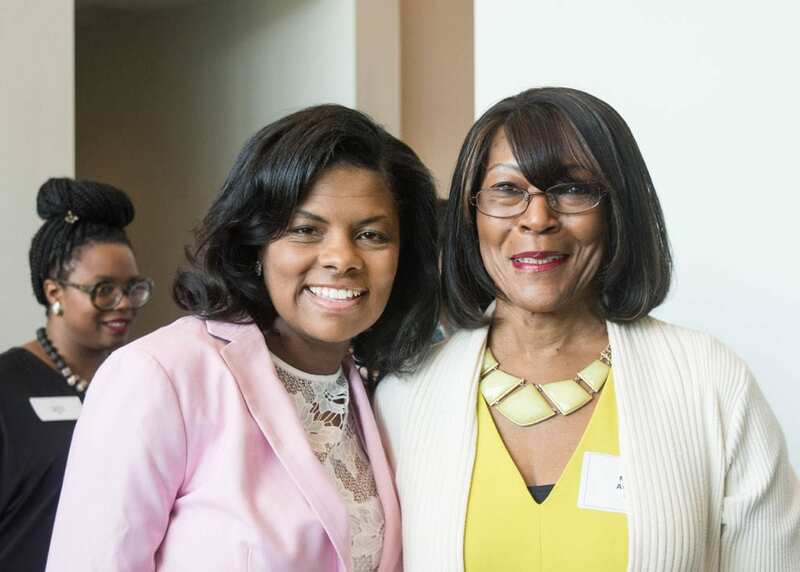 Wiseman served as presiding judge in the long-running Metro schools desegregation case. He retired in 2013 as a U.S. District Court judge after 35 years of service. Dinkins successfully represented the plaintiffs in the desegregation case. He has served as a judge in the Tennessee Court of Appeals since 2008. Other program speakers included Lajuanda Street Harley, one of the original “Nashville 16” African-American first-graders who integrated Metro Nashville Public Schools in 1957, and singer-songwriter Kate Campbell. 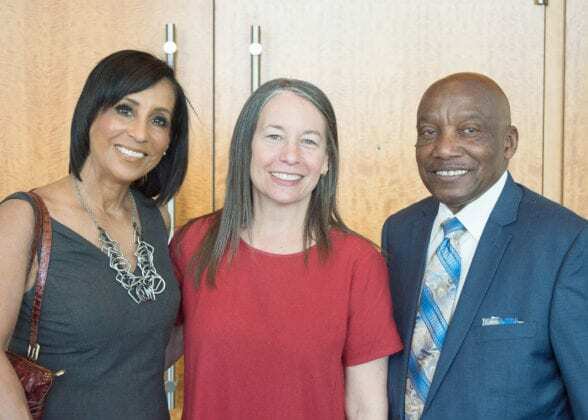 Campell, a Donelson native, was bused as a ninth-grader to historically black Cameron High School in in the early 1970s. Monserrat Escobar Arteaga, Martin Luther King Jr. Academic Magnet High School senior and a finalist for 2018’s Nashville Youth Poet Laureate, closed the program. WTVF NewChannel 5 anchor Vicki Yates, a close friend of Francis Guess, was the emcee. 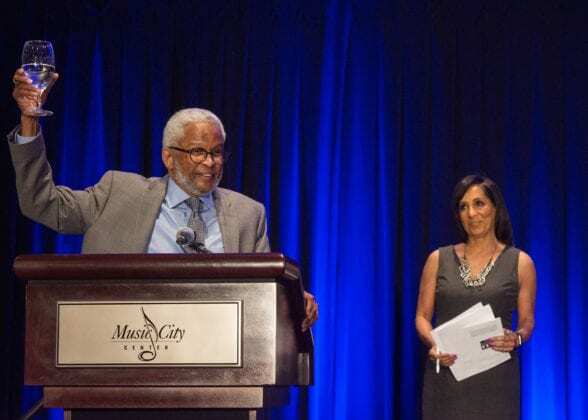 The Francis S. Guess Bridge to Equality Fund was established in 2015 at The Community Foundation to honor Francis S. Guess’ life and continue his work breaking down barriers and building bridges. The award is given annually to individuals who, like Francis, have helped others attain equality and have created opportunities for all. Francis S. Guess (1946-2015) was a Nashville trailblazer in his business and civic life as well as a tireless champion for civil rights. He served 30 years on the Tennessee Commission on Human Rights and was appointed by Ronald Reagan to the U.S. Commission on Human Rights. 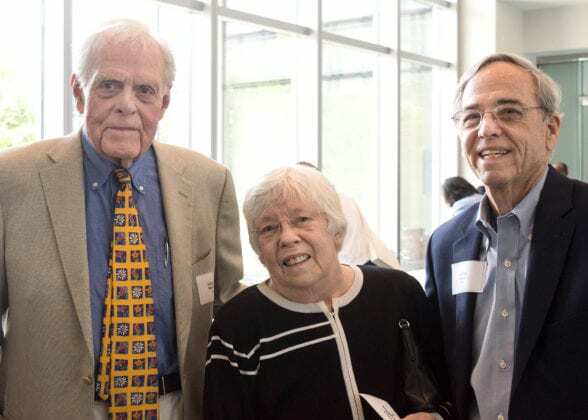 A resident of Bordeaux, he served on more than 100 boards and commissions and had a lifelong commitment to building bridges and creating equal opportunity in the community he loved. Lajuanda Street Harley, one of the original “Nashville 16,” speaks to the crowd. Judge and honoree Richard Dinkins leads a toast to the memory of Francis Guess. Judge and honoree Richard Dinkins, left, and Arnett Bodenhamer, Sr.
l-r; Judges Gil Merritt, Cissy Daughtrey and retired Judge George Paine. 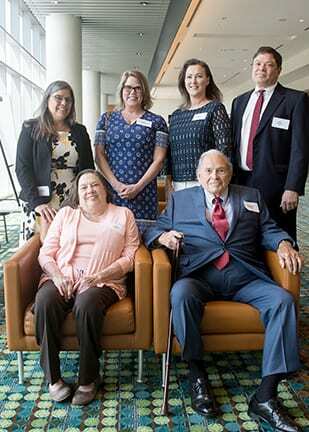 Seated l-r; Emily and retired Judge and honoree Thomas Wiseman with daughters Back row l-r; Sarah Wiseman, Mary Wiseman Rochester, daughter-in law Janet Wiseman and son Tom Wiseman. 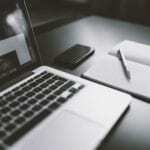 Next articleWhat is a Dry Socket?